This page is intended to guide our students through configuring their computers for use in their studies. We encourage our new students to work through this list before orientation. IT help will be available at Newberg and Portland orientations to connect your laptop to the wireless network(s) and to assist with any items on this list as needed. If you need assistance, we welcome your call or email at our Service Desk. Download and install the Mozilla Firefox web browser from Mozilla.org. 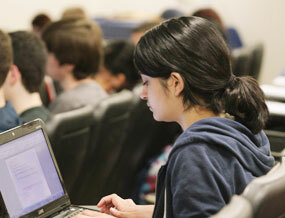 We have found that many of our students can get around problems with a web page by switching to a second web browser. Install both Flash and Shockwave from Adobe.com. These little programs can help you access media resources you may encounter during your studies. Download and install Microsoft's file converters so you can open newer Office documents sent to you by professors or classmates. Windows users look for "Office Compatibility Pack" at Microsoft.com/downloads. Apple users go to Microsoft.com/mac/downloads and look for "Additional Tools" and then "Open XML File Format Converter". Make sure you are running and updating a good antivirus program. If you don't have one buy one and install it. We suggest Microsoft Security Essentials, which is free from Microsoft. If you are already running an antivirus program but want to upgrade we strongly suggest you uninstall your current antivirus program before installing the new one. Install both QuickTime and iTunes from Apple.com/quicktime. QuickTime will give you access to commonly used media files, and iTunes will allow you to access iTunes U for university media content. Install Acrobat Reader from get.adobe.com/reader. If you have an earlier version of the software, please make sure you are updated to at least Reader 8 (11 is the current version). Make sure you are running and updating a good antivirus program. If you don't have one, buy one and install it. We'd suggest Sophos. If you are already running an antivirus program but want to upgrade, we strongly suggest you uninstall your current antivirus program before installing the new one. Again, if you have any questions or problems along the way, please do contact our Service Desk by phone or email for assistance.